A planned 10,000-seat arena for Bristol has been abandoned, the developers announced on Thursday. But mixed housing and commercial development will still go ahead. A news conference was told spiralling costs to develop the arena, currently standing at £86m, could not be justified if publicly funded. Around £13m has already been spent purchasing and clearing a nine-acre site for the arena near Bristol Temple Meads railway station. Bristol City Council had committed to contribute £16m in land and money and the South West Regional Development Agency (SWRDA) had committed £30m to buy the land, clean it up and provide infrastructure, master planning and feasibility studies. 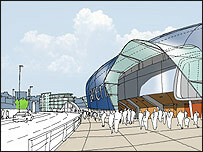 At least a further £40m would still have been needed from the public sector to fund an arena. Since 2005 the public sector partners - the SWRDA and Bristol City Council - have been working with private sector consortium Bristol Waterside Arena on the project. A mixed housing and commercial development, which could include shops and leisure facilities, is still planned by the SWRDA to take place as part of the wider £750m Temple Quarter development which is transforming the area. Ian Knight, SWRDA area director, said: "We are very disappointed that it has not proved feasible to build an arena for Bristol, but the latest figures show that it would simply not be a good use of public money. "We were always supportive of including an arena in this development - but not at any price. "Whilst our initial feasibility studies demonstrated that an arena could be viable, more detailed work on the specific designs and the building and infrastructure costs had to be carried out before we could make a further commitment. "This work has revealed that the costs are higher than was originally anticipated, and combined with changes in the market, have made it too expensive to deliver."